A New System, a Textbook and a Sledgehammer to Conformity! The rise of education in Canada is highly connected with its societal changes, economic needs and political agendas of the time. In the 17th century, children were educated through apprenticeship training. Skills from the family were passed down from one generation to the next. Adults were disgruntled with child labour in the workplace due to the fact that children were taking jobs away from adults. The industries rationale behind child labour was for cheap pay and compliancy. 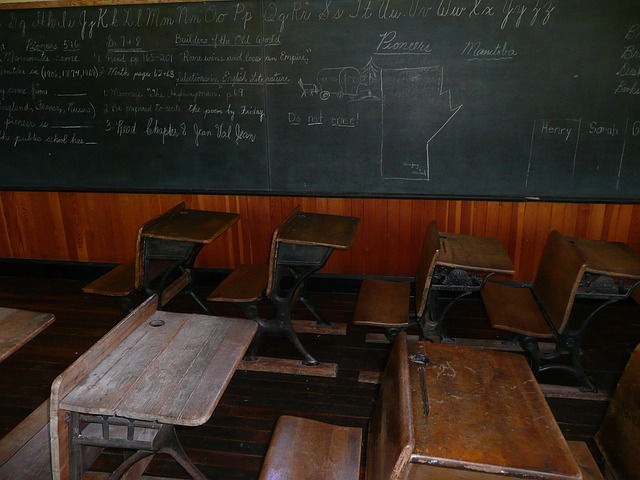 Eventually, nationwide compulsory education was put in place and the transformation of children in the work place to the school system was in hopes that children would conform to the type of worker that was compliant and productive. The industrial revolution initiated the rise in textbooks and embraced a type of knowledge that was linear in thinking. The education system taught values and concepts that led students beyond the ability to challenge ideas. Textbooks separated concepts thus doing little to connect teaching across subject areas. During the 18th and 19th century, informal education within the family home made its transformation into a more formalized educational setting. During the initial development of the Canadian schools, there was a large wave of British immigration, which brought about British spellers in schools as well as imported textbooks from the US and from the Irish National School series. “The British government looked to education as a way of promoting cultural identification with Protestantism, the English language and British customs” (History of Education, 2012). Closer to the 19th century, school promoters such as Egerton Ryerson, Jean-Baptiste Meilleur, as well as John Jessop worked together to design our public education system. The Canadian Encyclopedia (2012) reports that school promoters believed that mass schooling would encourage appropriate modes of thought and behaviour into children not just academic knowledge. “School systems were designed to solve a wide variety of problems ranging from crime to poverty, and from idleness to vagrancy”. (History of Education, 2012). Over the years, textbooks have provided educators with a resource that created a set design of subjects, which has helped to establish what was appropriate for education. At the time, it offered a new perspective on the way that concepts were transmitted to the young and served to bring about a uniformed curriculum. The pressure of the textbook on educators and what was being taught and developed within the curriculum played an essential role on what was defined as important thus affecting what was passed on through our culture. “Little is left to the teachers direction as [the education system] becomes even more intrusive into the kinds of knowledge that must be taught, the end products and goals of teaching and the ways it must be carried on” (Apple, 1986, p82). Textbooks have instilled values into our society through the study of geography, history, economics and moral teachings, but whose values have we decided to follow? Have we taught our students not to dream by making sure they learn in a particular way, meet a specific expectation and follow a set guideline of facts that are ‘certain’ to be true? The Industrial Age has permeated our culture and continues to do so today. Textbooks have a significant role in our education because they are the “primary vehicles for delivering content knowledge, for determining in large measure what goes on in a class” (Lebrun, Lenoir, Laforest, Larose, Roy, Spallanzani & Pearson, 2002). So what then constitutes a quality textbook. Our views on education have changed radically in the last century, but how about the resources we use to drive our learning? Along with new social practices and new literacies, our textbooks have remained quite linear in their thinking and their purpose has remained stagnant. Textbooks “are processed into existence using the pulp of what already exists, rising like swamp things from the compost of the past. The mulch is turned and tended by many layers of editors who scrub it of anything possibly objectionable before it is fed into a government-run “adoption” system that provides mediocre material to students of all ages.” (Ansary, 2004). We no longer require that students meet a particular mold as ‘assembly line workers and conformists’, so why then are we still providing them with resources that contribute to this type of learning? Textbooks today are still broken up into subjects and provide educators with a resource that is rarely used in classroom learning. For educators who are still solely using these resources, are they enabling a child’s experiences to extend past the book itself? Can they deviate past the confines of the curriculum? If textbooks drive our education and prepare us to take hold of our dreams then they should represent the present as well as the future. “Education has failed to take into account how much of the world has changed during the information technology revolution. It proceeds as though the world is the same as before just somewhat more technologized” (Lankshear & Knobel, 2003). If textbooks do not meet our current standards of learning then in the end, it’s all in the way that the educator chooses to use them. No longer do textbooks drive learning as once before. Nowadays, students are in control through the discovery of ideas and applying these ideas to new situations. But for educators, teaching without a text in mind requires more prep time and an increased amount of technology and manipulatives in the class. It will take time and extra funds in order for educators and students to learn how to facilitate learning outside of the ‘text’. We as a population are the resource and the knowledge. The community and political leaders must also support this idea. The limitations of the printed book call for a new way of thinking not just within the education system, but also as a society. Although print is still needed, other resources and connections must now accompany it. Students need technological resources to extend further and search independently while drawing their own conclusions. Textbook developers should be creating resources not only associated with print but resources to extend the lessons within the book. Resources such as board games, e-readers that provide hypertextual links, multimedia extensions of real life connections or even linked lessons on the SMARTexchange site for SMART boards. These types of additional tools will help to drive our learning and push us past our limitations to new heights of understanding. Apple, M. (1986). Teachers and texts: A political economy of class and gender relations in education. New York, NY: Routledge. Lankshear, C., & Knobel, M. (2003). “Changing knowledge and classroom learning.” Philadelphia: Open University Press. Provenzo, E., Shaver, A., & Bello, M. (Eds.). (2011). The textbook as discourse: Sociocultural dimensions of American schoolbooks. New York, NY: Routledge. The Canadian Encyclopedia. (2012). Historica Foundation. In History of Education. Retrieved October 20, 2012., from http://www.thecanadianencyclopedia.com/articles/history-of-education.